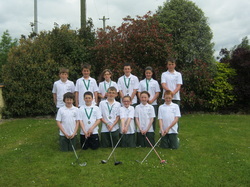 Yesterday on the 23rd of May our school took part in the Meath Primary Schools Golfing Cup. We set out to play our 9 holes in Blackbush Golf Club at half nine in the morning. We were playing against nine schools. There were four boys on each team and four girls on each team. We also had a Skills Challenge Team. On our Boys’ Team were Gavin McKane, Sean Keogh, Andrew Battersby and Mark Phelan. On our Girls’ Team were Laoise Nolan, Nicole McDermot, Jessica Brennan and Grace O’Dowd. Playing on our Skills Challenge Team were Sam McSweeney, Mark Nolan, Niall McLarnon and Ian Battersby. We played our nine other holes with three other pupils from other schools. It was a hard game as we played in rain and gale force winds! After we played the nine holes, we headed into the Club House to change and then we were served a delicious lunch. When we were eating our lunch some people from the Golf Union of Ireland came up and gave speeches. Then when everyone had eaten and the speeches were over, it was time for the results. After the 1st prize was announced, they called out St. Andrews Curragha! We came 2nd in both the Boys’ and Girls’ Team Competitions and we got silver medals. Sam’s name was called out as winner of 2nd prize in the Skills Challenge. Then when we thought all the prizes were announced, they called out Mark Phelan’s name. He got the most points out of the boys and won Player of the Competition! After all the drama we went outside and had our picture taken and headed home with a victory. What a day for St. Andrew’s!